From the Department of Neurology (M.A.M., S.J.P., C.A.P., M.L. ), Institute of Genetic Medicine (N.L.S., D.A., D.V., K.H.B. ), and Department of Pathology (K.H.B. ), Johns Hopkins University, Baltimore, MD; and Department of Neurology (T.-S.N. ), Chonnam National University Medical School, Gwangju, South Korea. 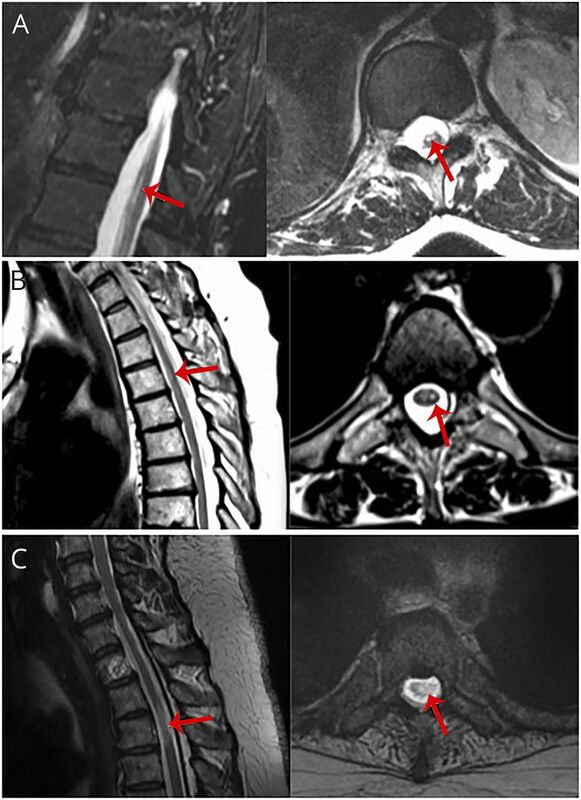 (A) Sister 1 with idiopathic transverse myelitis (ITM) shows a T2 hyperintense lesion 38 years after the onset at T8/T9 (arrows). (B) Sister 2 with ITM shows an acute T2 hyperintense lesion at T4/T5 (arrows). (C) Unrelated patient with ITM shows an acute T2 hyperintense lesion at T3 (arrows). (A) Electropherogram of the patient reveals a nonsynonymous homozygous C-to-A substitution (red arrow) at position 700 bp of VPS37A (c.700C>A, p.Leu234Ile). (B) Electropherogram reveals a heterozygous c.700C>A mutation (blue arrow) in patients without idiopathic transverse myelitis. (C) Representative electropherogram of VPS37A from normal controls (black arrow). 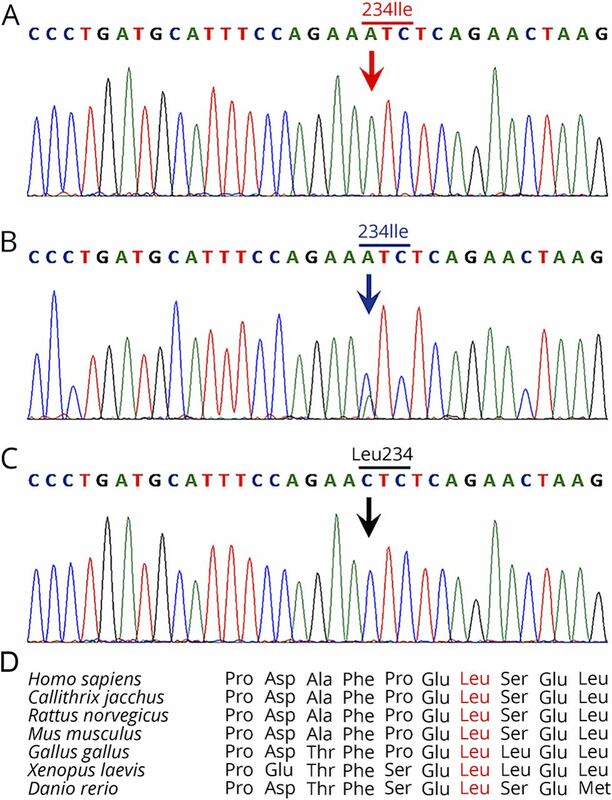 (D) p.Leu234 residue is highly conserved and found in evolutionary distant orthologs down to zebrafish. The sequences were derived from GenBank records with the following accession numbers: Homo sapiens (NP_689628.2), Callithrix jacchus (marmoset; XP_008977480.1), Rattus norvegicus (Rat; NP_001020038.1), Mus musculus (house mouse; NP_291038.2), Gallus gallus (chicken; XP_420687.1), Xenopus laevis (African clawed frog; XP_018105271.1), and Danio rerio (zebrafish; NP_956284.1). 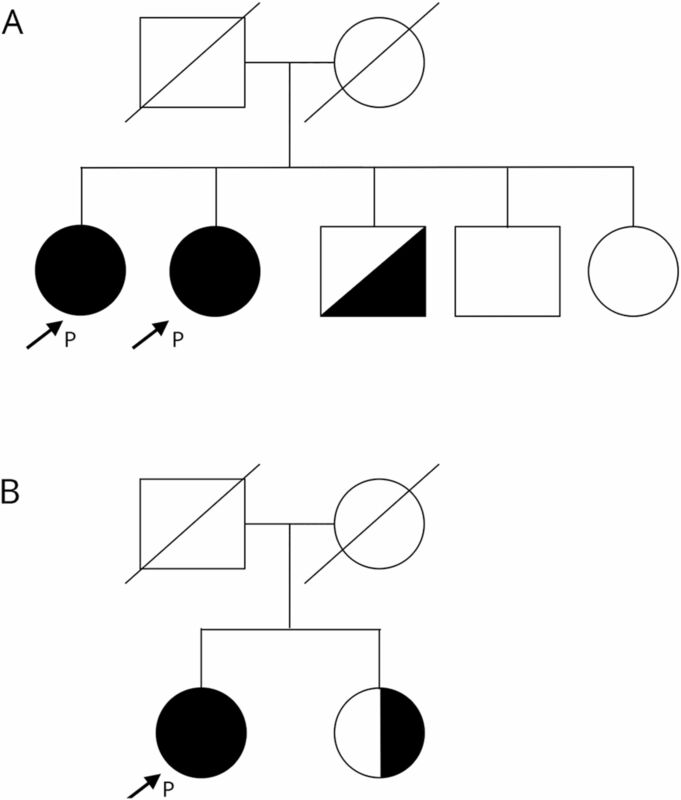 (A) Family with 2 affected sisters who are both positive for the VPS37A mutation (closed circles, P arrows) and 2 healthy brothers, one of whom is a carrier (half-filled square) and one of whom is not (clear square) and a healthy sister (clear circle). Their parents are not available to be tested. (B) A patient with idiopathic transverse myelitis was screened and found to have the mutation, with no known family history (closed circle, P arrow). Her sister is a healthy carrier (half-filled circle).